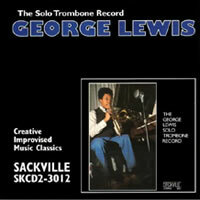 Originally issued by Sackville in 1976, Solo Trombone Record was made by George Lewis when he was only 24. The album is surprising, especially for a debut. In addition to being the very first record released under Lewis’ name, it was also his first unaccompanied solo effort. At the time, Lewis’ star was on the rise as an erudite, well-rounded member of the Association for the Advancement of Creative Musicians, exemplified by his work in both Roscoe Mitchell and Anthony Braxton’s quartets and a touring stint with Count Basie’s Orchestra. Although seemingly unorthodox, in retrospect, the session’s eclectic program is prescient of his future oeuvre, foreshadowing not only his mastery of experimental long-form composition, but also his steadfast devotion to the jazz tradition, in all its permutations. “Toneburst (Piece for Three Trombones Simultaneously)” opens the date in epic fashion. The labyrinthine composition features three overdubbed horns cooperatively exploring a broad spectrum of techniques and tonalities, presaging Lewis’ later work using interactive computer systems and the studio itself as an instrument. Alternating approaches, Lewis’ elegantly intertwined lines yield a vibrant series of multihued stylistic variations; whether harmonizing in lush counterpoint or coalescing in cubist abstraction, his virtual triadic interplay is fully realized by a singularly imaginative virtuosity. 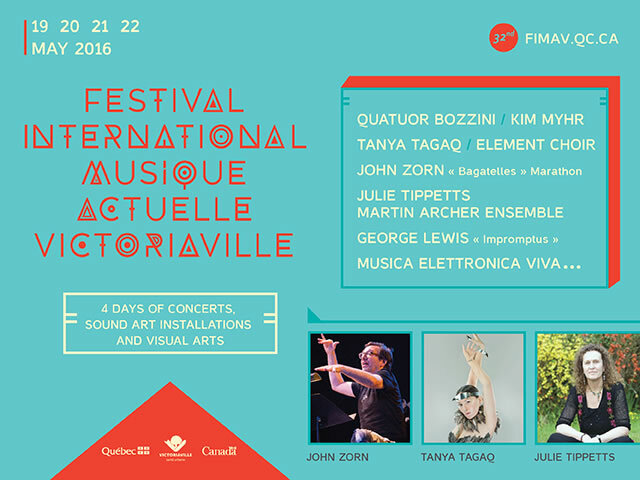 The remaining three selections are all performed solo, without any overdubs. “Phenomenology” presents the trombonist at his most vociferous, tearing into pithy blues-inflected motifs with unfettered zeal, using a plunger mute and vocalized overblowing to impressive effect. The comparatively subdued “Untitled Dream Sequence” ventures into equally probing territory, its deconstructed bop-inspired refrains tempered by a gentle romanticism – the latter of which comes to the fore on the closing number, a disarmingly tender rendition of Billy Strayhorn’s “Lush Life,” delivered with mature lyricism. 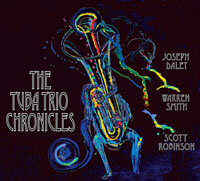 Trumpeter Dave Ballou delves into similarly spartan territory on Solo Trumpet. 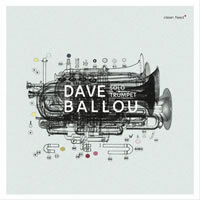 In addition to leading ten distinctive albums, Ballou has worked in a wide variety of settings, ranging from large ensembles like Either/Orchestra, John Hollenbeck’s Large Ensemble and the Satoko Fujii Orchestra, to small combos led by such artists as Dave Liebman, Denman Maroney and Tom Varner – but this is his first unaccompanied effort. Rather than following the standard conventions of melody, harmony and rhythm, Ballou commits to the investigation of new performing techniques and horn vocabularies, finding commonality with younger innovators like Peter Evans and Nate Wooley – one tune, “Wooley Warmth,” is even dedicated to the latter. Eight of the ten performances are improvisations, recorded live in the studio with no edits or overdubbing; the remaining two pieces are based on notated material. The differences between the improvisations and the notated material are less noticeable than one might expect however – a testament to Ballou’s spontaneous compositional foresight. The pre-written numbers, “LAF” and “Another Fool,” are serene ballads underpinned by strong melodies, in contrast to the experimental abstractions that dominate the set, such as the muted vocal acrobatics of “Mumbling” or the altissimo theatrics of “Sheets.” Yet focused excursions like “Tightly” and the ten minute “Construct” exhibit a narrative logic that sounds pre-composed, lending the session an overall sense of stylistic unity. Taken as a whole, Solo Trumpet is a worthy addition to a rarefied field. 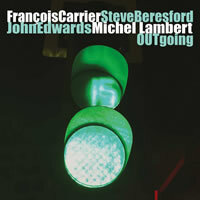 Recorded live in May of 2014 at the Vortex Jazz Club in London, OUTgoing finds alto saxophonist François Carrier in the company of three of his closest collaborators: pianist Steve Beresford, bassist John Edwards, and drummer Michel Lambert. They previously recorded together at the Vortex in 2011, which can be heard on Overground to The Vortex, while Carrier and Lambert have recorded multiple duo albums, and teamed up with pianist Alexey Lapin on several others. Given their deep history playing together, it comes as no surprise that their rapport and impressive hookup creates inspired and scintillating moments. Of OUTgoing’s five cuts, which are spread over the course of 78 minutes, two feature the trio of Carrier, Edwards, and Lambert. Beresford joins the group on the last three, which also happen to be the album’s most dynamic. As the title would suggest, OUTgoing is all about the journey. This comes at an expense however, as little in the music indicates the arrival at a destination, or even a hint of what that destination may be. Carrier’s lines suggest a restlessness, a searching, an almost impatience with the present, and a need to keep moving forward, even if it comes at the expense of moving past an idea before it can be fruitfully developed. While there is much in the way of textural, timbral and dynamic variation, the group at times relies too heavily on using an amorphous and quasi-implied meter that undergirds and encourages extended rubato lines. This nebulous time leads to a feeling of stasis, that when juxtaposed against the music’s searching nature creates a tension that never quite resolves. OUTgoing’s highlight is the final track, “Stoke Newington.” This 21 minute workout features the group’s communication and ensemble-first approach at its best: phrases are echoed, traded, toyed with and handed back to their originator; ideas snake through the group as they grow in complexity; and loud and active sections transition into sparse and pointillistic episodes with immediate ease. “Stoke Newington” also finds the group more willing to settle into – albeit briefly – what could be a grounding groove. Following the consideration of a short shuffling march halfway through the cut, Beresford suggests a wisp of a waltz that is quickly overshadowed by an uncanny and fortuitous meeting of Edwards and Carrier playing nearly the same pitches, articulation, and rhythm. The sideways march resurfaces, subsides, and gives way to what could be, but stops just short of a free jazz blowout. Carrier drops out and Beresford takes over, almost reaching a Cecil Taylor-esque intensity. Following a brief drum solo the group flirts with an easy medium swing 30 seconds from the end, but Carrier can’t bring himself to commit. His unease and relentless push forward is a perfect heuristic for the album. OUTgoing takes the listener to a bevy of new places and showcases an astonishing amount of inventiveness. But despite Carrier and company’s collective creativity, energy, and passion, there are few truly surprising moments. OUTgoing takes the listener on a fascinating and at times enthralling journey, but at its end one wonders: where have we been, where have we been going, and why? The centerpiece is the twenty-minute “Terrarium” which makes use of a variety of electronic and computer-generated sounds, mostly carpeted flowing textures that, along with gentle marimba flecks and low brassy whines, gives the opening several minutes a meditative, somewhat new-age quality. Augmented by wood, string plucks and occasional programmed flourishes, Smith’s melodic invention and airy charge takes up the middle section in detail, brash and chiming against the low warble that eventually creeps in as Robinson’s contralto clarinet appears in gauzy swaths. Rivers’ most well-known composition, “Beatrice” begins on unaccompanied vibraphone, ringing globules that set the stage for the halting clamber of tuba and bass flute, Daley’s whinnying caresses and Robinson’s pillowy tenor granted a gorgeous chamber flexibility. The disc is bookended by “Interplay” and “Proclamation,” both of which are based on Rivers’ structural concepts but which have their own tough energy, due in part to the measured flint that comes out of Robinson’s horn (bass saxophone on “Proclamation,” tenor on “Interplay”). The opening “Interplay” is probably the disc’s rawest number, jaunty rhythmic patterns opening out into glinting vistas of taut conversation and lilting balance. The best respects paid are those which carry their own personality, and the music of Daley, Smith and Robinson holds forth eloquently in that regard. 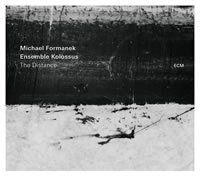 The Distance is the premier of Michael Formanek’s 18-piece big band, Ensemble Kolossus. The veteran bassist’s third release for the revered ECM imprint follows Small Places (2012) and The Rub and Spare Change (2010), his two highly regarded quartet recordings with saxophonist Tim Berne, pianist Craig Taborn and drummer Gerald Cleaver. In this greatly expanded setting, Formanek’s abilities as a composer and orchestrator take center stage, with sophisticated charts that evince a panorama of big band styles, including everything from opulent voicings to angular themes. Conducted by fellow bassist Mark Helias, this ambitious all-star effort elicits a wide range of dynamics, delivered in myriad settings conceived by Formanek to highlight individual soloists in the grand tradition of visionary bandleaders like Duke Ellington and Sun Ra. Ample time is allotted to spotlight individual performances; key among them is Mary Halvorson’s extended extrapolation linking “Echoes” and “Without Regrets.” Her pointedly oblique fretwork majestically ascends from spidery tremolo-laced fragments into hypnotically repeated mantras as it transitions between sections, intensifying the proceedings in turn. Trumpeter Dave Ballou concludes the suite with a similarly bracing excursion, bolstered by an array of expressive extended techniques. Emerging from the shards of an ecstatic but orderly collective improvisation, Ballou’s valedictory statement gradually builds to a climactic finale, his flinty cadences buoyed by Halvorson’s pitch-bending distortions and drummer Tomas Fujiwara’s unflagging intensity – closing a superlative addition to the modern big band tradition on a rousing high note. Jürg Frey is inextricably tied to the group of Wandelweiser composers and musicians, and like that group, his music continues to elude easy categorization. The last year has been a particularly fruitful one, revealing extensions to his compositional approach. There was the release of the two-disc set Grizzana and other pieces 2009-2014 for small ensemble on the Another Timbre label as well as his residency at the Huddersfield Contemporary Music Festival, featuring multiple performances of his pieces. Two other releases, Circles and Landscapes and String Quartet No. 3 / Unhörbare Zeit deserve special focus as each represents the continued development of Frey’s compositional sensibilities. 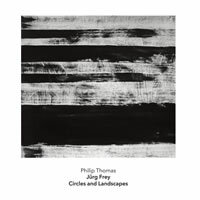 Circles and Landscapes features a program of solo piano pieces performed by Philip Thomas, one of the preeminent interpreters of contemporary piano compositions as well as an accomplished improviser. Pitch relationships have always been central to Frey’s compositions, and in these pieces, composed over the last five years (with the exception of the opening “In Memorium Cornelius Cardew” from 1993) the harmonic underpinnings are even more pivotal to the structural foundations. In an interview on the Another Timbre site, Frey states, “I'm looking to find a confidence in chords, dyads and single notes, and I hope that accordingly they will resonate with confidence. This applies to every material, whether stones or a piano, but with the piano it seems to be more challenging because of the clarity of the material and how the instrument itself suggests it should be used.” The opening “In Memorium Cornelius Cardew” moves with slow assurance back and forth between low register intervals and a resonant chord, pausing midway to progress to a deliberately paced, falling phrase which pools in darkly voiced chords. Three pieces from the “Circular Music” series, composed a decade later, distill that concentration on intervals and resonance with poised consideration. Here, the notes and harmonies are allowed to sit. It is not about motion or development, but rather about simply letting the sounds unfold across the duration of the piece. Frey has stated about his music, “A sequence of notes is most composers' starting point. And it's where I stop. Not that I cease to do anything at all; sometimes it takes a bit more, sometimes a bit less. There are so many traps, so many ways of destroying the sequence, because people think it needs a little compositional help ... More important is the relation of the material to elapsing time.” Listen to the half-hour reading of “Pianist, Alone (2),” and one hears these elemental building blocks accrue with a steadfast forbearance. Thomas places each phrase and chord-set evenly across the duration of the piece and the music advances with an unwavering beauty bereft of any standard notion of melody or harmonic progression. “Extended Circular Music No. 9,” composed over 2014 and 2015 layers in even more brooding consonance over its half-hour course. Yet even here, the music proceeds with notes and chords sounding alone with a sense of succession rather than melodic or harmonic progression. Frey’s string quartets, particularly “Striechquartett II,” are some of his most absorbing pieces, particularly as performed by Montreal-based Quatuor Bozzini. In these pieces, the composer makes potent use of the microtonal nuances of the string instruments to elicit fragile, almost vocalized voicings of his poised harmonic structures. Where his second string quartet created a diaphanous scrim of sound, on “String Quartet No. 3,” he opens things up, introducing a spaciousness to the deft voicings. 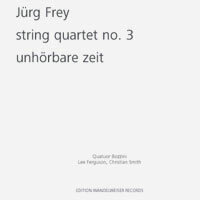 The members of the quartet are completely synched in to Frey’s strategies, fully embodying the tonal structures into a singular sound. Frey writes about this piece, “Elemental materials and constructions are thereby perceived as a sensation, and mindfulness consists in hanging these sensations in balance before they have arrived at the limitations of expressiveness.” And it is the way that the quartet hangs at the edges of expressiveness, letting the sensations of the notes and harmonies play out without investing them with dramatic expression. It is this equanimity and stability that allows the piece to play out in a totally absorbing way. “Unhörbare Zeit” (inaudible times) adds two percussionists to the mx and here the structure opens up even more. The durations of silence are as central to the piece as the sounds of strings and the low rumbles of percussion. Frey states that he is working with “audible and inaudible durations that appear partly simultaneously and partly consecutively. They give the piece lucidity and transparency, as well as materiality and solidity.” While silence as a structural element has been fully absorbed into the vocabulary of contemporary composition, it is the way that Frey gives the silences weight and dimension within this piece that really stands out. The balance of the timbre of strings, low register percussion, the rustle of room sounds and the mercurial pacing of sound and silence is fully entrancing.